Spread your fingers out as wide as you can…now bring them all together as tight as you can. Easy, right? Now try the same thing with your toes. If this is a challenge for you, you probably have weak foot intrinsic muscles. It turns out that, like tight calf muscles, many people have weak foot intrinsic muscles. This is almost entirely due to improper foot wear. Most shoes, more than 99% of them, have narrow toe boxes that aren’t even shaped like feet. This restricts your toes, taking them out of the mechanics of walking and running, in which they are meant to perform an active role. After a lifetime of wearing these narrow shoes, those intrinsic foot muscles weaken, and our brains may even forget how to use them. Having weak intrinsic muscles can cause imbalances in our feet that may lead to painful foot disorders. 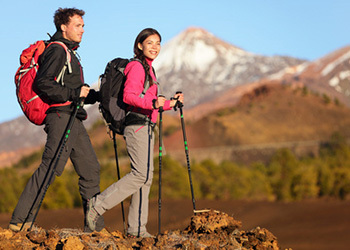 The best way to strengthen your intrinsic muscles is to walk and even run barefoot as often as possible. This trains the brain to engage those intrinsic muscles and allows them to become an active part of our walking and running mechanics, restoring balance to our feet. If you get pain with barefoot walking (usually on hard ground/tile floors) then you’re probably rolling off the ball of the foot instead of off a widely spread platform of the toes. That pain you’re feeling can actually be a good thing if you use it as negative feedback that you’re walking wrong. If you are able to spread the toes and push off with 50% of the force through the big toe and the other 50% divided between the smaller toes, then you’ll notice that you don’t get that pain in the ball of your foot with each step. Shoes will mask this feedback loop to good form. If you go the shoe route, you’ll notice that you have to get ever more and more padding below the ball of your foot and your shoes might even be shaped like a banana right at the ball of the shoe. Those are all signs that your intrinsics are weak and your calf muscles are running the show with an inappropriate imbalance. MUST be done using the pads of the toes while keeping the IP joints in extension and only flexing the MTP joints. If the IP joints flex, then it is only working the EXTrinsics. Check this by making sure the toenails are flat and parallel to the ground (not pointing towards the ground). The idea is demonstrated in the “Toe waving” video below. This is a key point, contact me if this is not clear. You can do the exercises below with nothing between or around your toes. However, when you get stronger and better at them, you can try adding a rubber band around the toes for an extra challenge. Stretching the extensors and strengthening the intrinsics will start to return the normal fat pad to its correct location below the ball of the foot (metatarsal heads) instead of in from of the ball of the foot where it is doing no good for anything at all (distal and dorsal migration of the plantar fat pad). 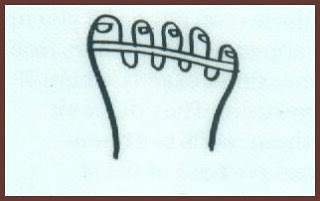 Correct movement of the toes. Movement at the knuckle where the whole toe moves as a straight unit, rather than curling the toes as he demonstrates at the end of this video. Ray McClanahan DPM is one of those physicians who understands the human foot better than most people out there. He also invented Correct Toes, which are a great aid to many of the exercises Dr. Hoopes encourages his patients to do. She’s mistakenly saying that the foot intrinsic activation brings the arch up (instead of the peroneus longus), but the exercises are still well demonstrated in terms of toe spread and big toe isolation and abduction. This time with more advanced single limb stance exercises to test and strengthen your intrinsics and to isolate the big toe.